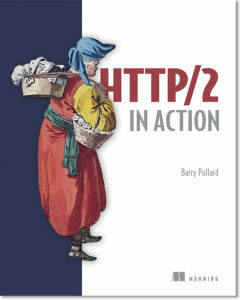 Take 40% off HTTP/2 in Action. Just enter code anpollard into the discount code box at checkout at manning.com. The Hypertext Transfer Protocol, or HTTP, defines how data travels on the web, including the billions of web page requests happening each day. HTTP/2 is the most significant upgrade to the protocol in 20 years. The new standard is more efficient, which means faster, safer web traffic. HTTP/2 in Action introduces HTTP/2 and teaches you everything you need to use it effectively! This animation compares the function HTTP/1.1, HTTP/2 and HTTP/2 with push.